Now with Pencil support. Apple refreshes its iPad and equips the tablet with a new chip (SoC), and the Apple Pencil is now supported as well. This was reserved for the Pro models until now. Otherwise, there are not many new features, as you can see in our review of the 2018 iPad. The new 9.7-inch iPad provides plenty of power, long battery life and Apple Pencil support, all for a fairly affordable price, even if this slate is not a Chromebook killer. 70% Apple iPad (2018) review: It's not perfect, but then again, what other choice do you have? If you want to go for the 2018 iPad and are not too keen on the Rs 46,300 variant, you can opt for a non-Cellular 128 GB variant which is selling for Rs 35,700 (around Rs 34,100 after discount on Amazon). If you are going for the 32 GB variant, I would suggest going for the cellular version. With such limited storage, you'll run out of space in no time, leaving the cloud as your only salvation. The 2018 iPad isn't close to a redesign or overhaul, but the iPad formula still works so we don't blame Apple for sticking to it. Priced Rs 28,000 and above, I would recommend the iPad for children of all ages as a good learning tool, which they can also have fun with. You will need to set some rules in place on how the time is divided between learning apps and games, because the latter can be more tempting at their age. I am not sure students needs the LTE version, so stick to a Wi-Fi only option. The Pencil is a good add-on, but expensive for just making doodle on notes. So think that over, or just look for cheaper alternatives, there are a lot of them in the market. However, I am convinced that going forward a tablet is something every child should have access to. Somehow they seem to learn faster with these. As the adage goes, don’t judge a book by its cover. So, we won’t blame those whose first reaction to the new iPad would be “what’s new in this” looking at its design. Apple CEO Tim Cook might not get on the cover of The Economist for revolutionising the education sector with the new iPad but Apple has knocked it out of the park by pitching it to the right audience with the right product. All the same, this isn’t the iPad to replace the model you bought last year. This is the iPad at the base of the pyramid. The iPad you buy when you want iOS, you want a tablet, and anything beyond those two prerequisites is a luxury. The key to the 2018 iPad is that you get a lot of computer for not much money. You can buy cheaper Chromebooks, Android tablets and, at a pinch, Windows PCs. Unless you’re looking for an app that doesn’t appear in Apple’s store, this beats all those devices for most people who have light computing needs. It’s not worth upgrading from last year’s model, but the new iPad is still the best tablet available at this sort of price. I’ve mainly been focused on comparing the new $329 entry-level iPad with the 2016 iPad in this review. I think it’s a valid comparison. I think it shows how focused the company is on bringing its most sophisticated technologies to a much wider market. Still, the unlaminated screen didn't put people off in 2017 and we don't suppose it will put people off now. And ultimately this is a fantastic deal for a decent (albeit flawed) tablet. Android tablets are a mess. The hardware may very well be decent, but it simply cannot compete with Apple in terms of app selection nor the quality of the app. And when there is a tablet version of a popular Android app, it is often not well optimized. If you really need a tablet device, stick to iOS and iPads or consider a detachable Windows notebook. Apple put a lot of resources into framing the sixth generation iPad as an education device first, with consumers being the secondary category. However, there's potential here for an inexpensive iPad across multiple industries and in businesses. The new iPad is an iPad Pro on a budget. You get many of the same features for a fraction of the price, and that makes it hugely compelling. If you want a mid-range tablet, this is our pick. You get a great screen, excellent performance, and the full might of the App Store. It's an ideal shared tablet for the home. For everyone else, this versatile and powerful slate is just the ticket for digital dabbling in that still potentially fertile ground between smartphones and laptops. If you're looking for the best tablet out there at the best possible price then this is it. Buying the 2018 iPad isn't crucial if you've got an iPad that's less than two years old but if you're looking to upgrade (or pick up your first) then this is definitely where you should start looking. On technical merits alone, the iPad Pro is the best tablet money can buy. It is wickedly powerful, thin, light, and it has a super gorgeous display. This iPad, on the other hand, is the best, for lack of a matter word, mainstream tablet. I don’t like to call something ‘mainstream’ because I find this label slightly derogatory, but what I’m trying to say is that, for most people, this is the tablet to buy. With prices beginning at S$498 for the Wi-Fi model with 32GB of storage, it is a very attractive proposition. It’s not so much about the iPad as about the person buying it. I’d wager that for most people, the $329 sixth-generation iPad is plenty of iPad at a pretty great price. For everyone who demands more, there are other options. As a fan of the iPad, I’m glad Apple has decided to offer both kinds, because not everyone needs to spend $600 or more on an iPad. For $329, you can get an iPad with the power and one of the banner features of the 2016 iPad Pro. That’s pretty great. On the other end of the spectrum, there are a handful of budget tablets in circulation, like those from Amazon, but they generally aren't ideal for media consumption. We can't stress enough about the new iPad's valuable package, and despite its minuscule upgrade, it's still by far the best bang for the buck you'll get out of a tablet. We'll start by conceding that this product is not intended for the likes of us. It's aimed squarely at the education section, and at the large segment of the population who fancy a cheapish tablet that runs iOS and runs it well. We will also point out that this is merely a preview based on our experience with the 2017 model and the announcement of specs and features in the new one - our verdict will have to wait until we've spent time testing it out. The iPad is the go-to tablet for consumers for a good reason: it’s the best there is. No Android or Amazon Fire tablet can compare, especially when it comes to app availability and overall capabilities. This is a very good tablet. The best, in fact, under $500. It’s too bad that nothing else comes close, because maybe that competition would have inspired Apple to make something a little better. The same price as last year's model but now with Apple Pencil support, the sixth-generation iPad is the best midrange tablet choice for most people. But it's still less practical than Chromebooks for most schools. This iPad retains the same design as the 2017 release but adds an important new feature: Pencil support. While Apple is happy for anyone to buy the new tablet, it’s clear there is a strong focus on education and what a bevy of these coming to the classroom can mean. There's a lot to like about Apple's new tablet offering. 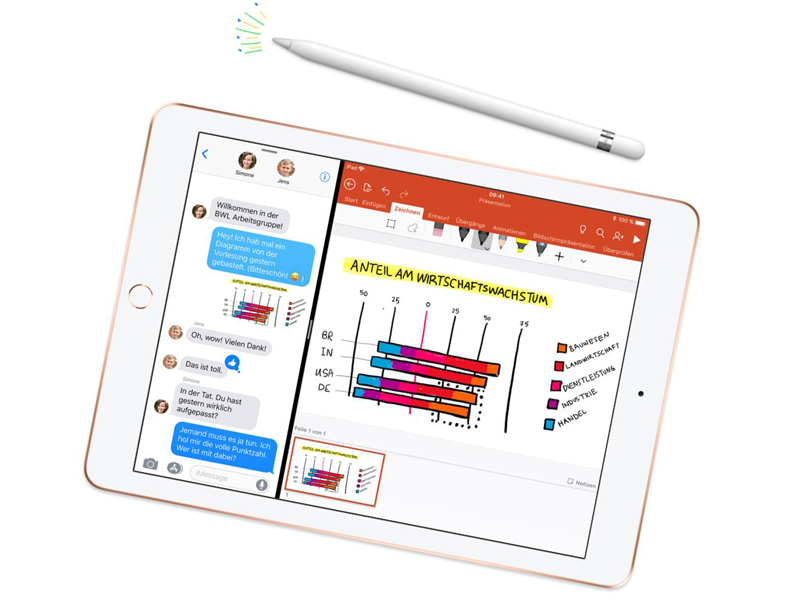 It's more affordable than ever, works with the Apple Pencil and, with a more school- and teacher-focused software offering, it will have greater appeal to educators than before. Ist die 6. Generation mit Apple Pencil wirklich gut? 84% Test : iPad 2018, Apple a-t-il enfin trouvé le juste équilibre entre qualité et prix ? Đánh giá Apple iPad 9.7 (2018): Bạn mong chờ điều gì ở iPad giá rẻ? Imagination A10 Fusion GPU: » Further information can be found in our Comparison of Mobile Graphics Cards and the corresponding Benchmark List. A10 Fusion: » Further information can be found in our Comparison of Mobile Processsors.